Warrenpoint Town manager Matthew Tipton. Pic by PressEye Ltd.
Matthew Tipton maintains confidence in the ability levels of his summer signings - but is calling on the players to turn reputations into reality. Last season’s Championship title winners returned to the senior stage with Tipton and the Town attracting plaudits for a string of key close-season additions. 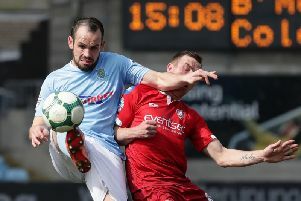 The arrival of established names such as Darren Murray, Sean Mackle, Martin Murray and Alan Blayney offered Warrenpoint confidence in clean sheets and a consistent scoring threat. However, a return of just two wins from 12 top-flight league tests has translated into a position within the relegation play-off zone in stark contrast to the summer’s high hopes. “I’m not in the business of hanging anyone out to dry but we must also face up to the reality of our results,” said Tipton, who returns this weekend as manager to the final club of his playing career. “Of our big names, only Darren Murray can really say he has delivered with six goals and that’s despite two red cards. “We felt we had turned the corner with the recent win over Ballinamallard but then suffered the same old problems again by taking the lead against Ards, missing loads of chances and conceding two goals. “Mentally you can see the impact on the players in that kind of situation but I accept mistakes are part and parcel of the game. “What I do need to see, however, are signs that everyone is in the battle together. A lack of consistency has disrupted Ballymena’s bid to build on the progress of last season which culminated in European qualification. However, the midweek return of Johnny McMurray to the side and scoresheet in a County Antrim Shield success suggests steps towards recapturing the momentum which pushed United up last season’s standings.